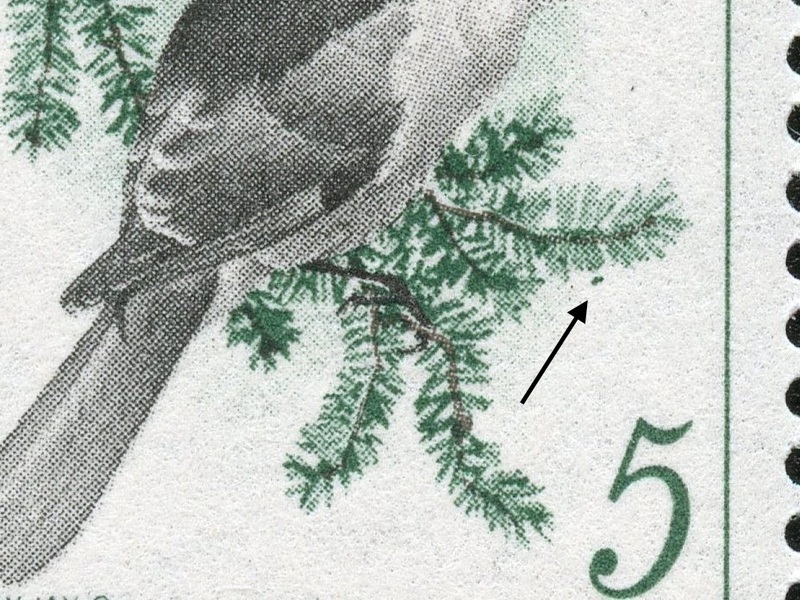 The value of a Gray Jay, Perisoreus canadensis - 5 cents 1968 stamp depends on several factors such as quality and wear, supply and demand, rarity, finish and more. Values in the section are based on the market, trends, auctions and recognized books, publications and catalogs. This section also includes information on errors and varieties and characteristics. 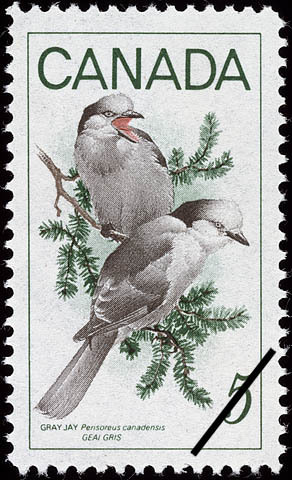 A pair of Gray Jays perched on boughs of a White Spruce have been chosen by the Canada Post Office as subjects for a stamp to continue a Wildlife series of postal issues. The Gray Jay (Perisoreus canadensis) is a bird of the coniferous forests of North America whose breeding grounds are in a broad unbroken geographic band extending from British Columbia and the Yukon to Newfoundland. The adult bird usually attains an overall length of 11" to 13", larger that a robin and reminiscent of a huge overgrown chickadee. Gray Jays nest very early, often while the ground is still covered with snow. The bulky nest is made of twigs lined with a thick insulating layer of moss, fur, caribou hair, and feathers, and is usually placed in a conifer 4 to 15 feet above the ground. The eggs, 2 to 6, are greyish, evenly dotted with olive-buff. The juveniles have smoky plumage as if they had rolled in soot, but by their first autumn, resemble their parents. Gray Jay, Canada Jay, Whiskey Jack, Camp Robber, or Moose bird, not matter by what name you call him, all travellers in the northern coniferous forests are familiar with this friendly rogue. This bird is extremely tame, bold, and very curious and will usually appear when a fire is built, or food is being prepared or eaten. The sound of a gun, or an axe will often bring it at once. Its flight is buoyant and silent as it glides from the top of a tree to the lower part of another, and then hops upward from branch to branch. When sufficient height is gained it launches out in another scaling flight, seldom flapping its wings unless a long flight is undertaken. In the northern forests the Indians were so superstitious about it that they were afraid to look at the nests and never molested it. Gray Jays will eat almost anything. Their diet includes insects, wild berries, small snakes, any kind of meat and fish, and any food left unprotected around camp. In spite of its impudence towards invaders of its territory, it is a retiring bird and vanishes inevitably as the borders of permanent settlement encroach upon its haunts. The Gray Jay issue brings to Canadian stamps the precise interpretations of a widely acclaimed Toronto-born young naturalist and artist, Martin Glen Loates. This is the first occasion on which a design by Mr. Loates has been used on a Canadian stamp. In size the stamp conforms to a new metric scale of dimensions adopted by the Canada Post Office for future issues. 4 colours, green, rose, brown and black were employed in the production of this stamp by the lithographic printing process.